The Experiment - a 4 minute video (return here with your browser's BACK arrow or button). Not recommended for dial-up connections. It uses a QuickTime Player. Hands-on participation assures learning during a teacher demonstration. You cannot not pay attention when your hands are participating. The video is not about clay. It shows only two of many different ways to join pieces of clay. being a participant in learning and constructing one's own knowledge. How do you get students (especially younger ones) to grasp the concept of blending the clay in order to attach it well? I've told them a zillion times, I've modeled it, I've shown examples of ones that have fallen apart, etc. I've been trying to catch them before they put them on the drying tray, but it's simply impossible to catch every single project. Is there some trick I'm missing here, or is it really a learn by experience kind of thing? With clay, touching is essential. Clay gives kinesthetic pleasure. It is so easy to forget oneself in the trance of creative work. It is multi-sensory and more tactile than nearly any other material. I have been a clay teacher since 1960 and have coached every age from 3 to older than me and experimented with many approaches. I have concluded that clay should be in every student's hands before I start any kind of instruction. This way I can see them doing their own experiments rather than watch me show them my way. For very young children, I let them do as they wish without any instruction. They approach everything with a good instinct to experiment to learn about it. TELL me and I forget. SHOW me and I am entertained. Have me DO IT and I remember. For school children, since many have lost much of their freedom and imagination, I give them experiments to do before they make projects to be fired. Generally, school and other adults have taught them to expect to be told what to do, how to think, and what to learn. It can take some effort to restore instinctive learning joy for many of these children. I find that even potter's wheel learning is better when I teach in front of a circle of wheels where every student is doing it and I can see them all doing it as we work our way through the more challenging parts until everybody has the kinesthetic FEEL of what works as well as the feel of the things that do not work. I teach the wheel to any age from kindergarten on, but I would not recommend it for elementary school unless you have a skilled potter who understands learning. Clay sculpture is great for toddlers that can be supervised to keep it out of their mouths. Of course clay can be sterilized with heat, so tasting it would not be a problem. Some cultures use it in cooking. Many of our pills use sterile clay to bind them. I LEARN to DO a new skill by DOING it. When I watch things, I very soon reach a limit of how many new things I can assimilate. 1. Everybody starts by making four pieces of clay. Sometimes these are slabs, sometimes coils, or sometimes lumps for sculptures. 2. They put two pieces together with no instructions, but I tell them use their fingers to smooth over the seam until it does not show. 3. They put another two pieces together, but I have everybody work the clay together with enough rigor, digging across, etc. until the two pieces are mixed at the junction. This part I demonstrate several possible actions that I know will mix clay from the two parts together at the joint. The methods depend on how hard the clay is, but the clay must be between soft and soft-leatherhard. Dry clay or hard-leatherhard is too difficult to be joined. 4. Then they are encourage to smooth it over until it looks the same as their first example. 5. Next they are asked to pull on the parts until they come apart and examine the work try to decide which of the pieces ended up being the strongest. 6. Ask which would be the best way to make a puzzle that could be made from any individual parts to be assembled like Legos? 7. Ask which would be best for making a piece of pottery or sculpture that would be less apt to come apart during the drying and firing processes? 8. While they are working on pottery or sculpture I glance around. A few will forget when they get caught up in flow of creativity. If somebody forgets to make good joints I might ask them if they are working on a puzzle? If they are making a puzzle, fine. They can add Velcro to the joints after it is fired. Sometimes when I notice that somebody is not remembering I might ask if they remember what we learned from our experiment? Try having each student write down a prediction or speculation of what they think might happen. At the end, have them write down and draw what actually happened. Clarify the cause of what is discovered. Consider having experiments done by small teams so students can help each other and so they can compete with other teams for discoveries. 1. Having some four inch pieces of slab that you have allowed to become leatherhard. Ask students to add a four inch soft slab to it at a right angle. Set them to dry until the next time they meet, or put them in front of a fan or any place where they dry rapidly for 20 minutes. 2. Another experiment has them attach a slab that is very thin (about an eighth inch thick) to a slab that is about a half inch thick and see what happens as this experiment dries. 3. Another experiment requires that they have bisque fired some containers with simple covers. Put small dry slabs inside the containers to see how thick they can be without exploding when firing at normal firing speed. Having them inside the bisque containers saves on having to clean all the shards out of the kiln elements. 4. Another experiment has solid sculptures (at least 2 inches thick) in the bisque fired containers, but some of the pieces have had holes pushed in from the bottom with a piece of coat hanger wire at half inch intervals before the clay dried. See which ones explode in the firing. © Marvin Bartel 2008. Parents, pre-school teachers, and art teachers may make one copy for personal study. Permission is required to make copies, publish, or to post on another web site. Please mention the URL or the title of this page in your correspondence with the author. You do not need permission to make a link to this page from your page. Why Should We Fire Every Piece? Why do we fire the products? Sometimes it is more for us and for parents than it is for the children. Not every piece should be fired. Practice pieces are fine. Not every music rehearsal is broadcast on the radio. If a child makes three pieces before they are fired, it can provide a great choice-making process. Students can discuss the merits of their work with their peers prior to selecting one or two of three to be fired (one or two to be soaked and reprocessed as clay). This process provides a chance to learn mutual respect and empathic sensitivity. No clay is attached. Kids sit on the floor (not at a table) and are not allowed to set the clay down until the forming process is nearly complete. All the parts such as legs, head, tail, etc. are pulled from the lump with no pieces added on. I ask students to keep turning the clay in all directions to see how they like to make it from every side, top, and bottom. Then they can bring it to the table, add texture, add small additions, add features, decide on what its activity is, and so on. For every issue with clay there is probably an experiment. Making things is a form of continuous experimentation. Hands on experiments imprint the learning much better than any teacher's advice. I find it very interesting to get an unexpected result. Unexpected results are not mistakes. They are discoveries. Therefore, I never tell the students what to expect or why we are doing it, but I ask questions to increase thinking and curiosity. If you think you know how clay experiments will turn out, try this. Make a sturdy container with a close fitting lid. Bisque fire it. Place a freshly made wet sculpture of any thickness inside this lidded bisque ware container and bisque fire it immediately at the same speed as usual. Send me a photo of what happens. Sometimes I add sand to my clay. The white silica sand from the lumber yard is cheap and works okay for me. 5 to 20 percent sand can add character. More sand allows thicker pieces to be fired. Common sand sometimes works, but to know for sure, experiment. Some sand has ingredients that cause breakage after firing. This is tested by firing and then spraying a little water on the pieces to see if they crack or get pop-outs. I would guess that 90 percent of all art teachers have at least one student that lives on or near a place with clay that could be used in the classroom. 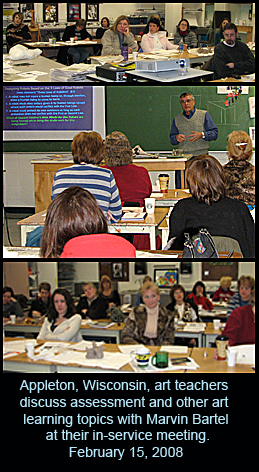 or workshop related to art education.